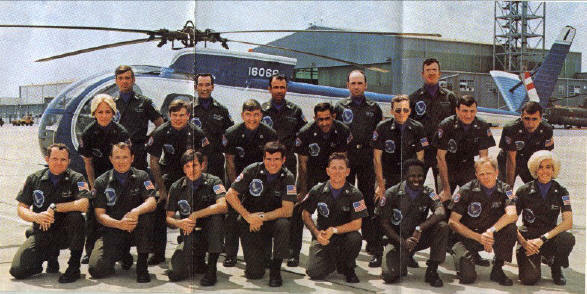 The enlisted members of the team were as experienced and professional as were the pilots. They were led by a Master Sergeant with 18 years of military service who was assisted by three Sergeants-First-Class, each with approximately 15 years service. Although the crowds usually noticed only the seven pilots who flew in the air show, the show really involved a team of more than 30 soldiers, many of whom preformed various duties not involving flying. Team support personnel included crew chiefs and mechanic operations personnel, and administrative personnel. These were the people who performed the many behind-the-scenes activities that ensured that the aircraft were always ready to perform on schedule.